Anchor Necklace can carry great meaning as a symbol of both luck, hope and steadfastness. The symbolism of the Anchor Necklace goes back thousands of years. When a ship raises its Anchor, it represents a safe end of a long journey and marks the beginning of a new voyage and adventure. What is more, when a ship drops the Anchor it grounds itself, and secures itself, to a certain spot from which it will not move, becoming steadfast. It stabilizes itself from the unpredictable elements of the sea waves, tides, and currents. An Anchor Necklace brings stabilisation and grounds those surrounded by uncertainty and reminds them that you are there to help support them. The Anchor is a metaphor for how each one of us feel when we pledge to move on and have a better, brighter and grounded future. We raise our Anchor, be bold, strong and venture into a new stage of our life. At this time we feel eager and are full with Hope, excitement, dreams, expectation, imaginings and aspirations. The symbolism of Hope that the Anchor carries encourages one to follow the course and plans we have made. Be steadfast in our vision of the pursuit of our new Dream. In the moment of stability and pursuit of new adventures, everyone needs a good luck charm to guide them on their journey, the Anchor Necklace is the ideal gift. Give them a symbol Hope and Steadfastness with this little gift, a truly thoughtful and meaningful charm to add to their collection. The perfect gift for someone needing a lil bit of luck in their life. 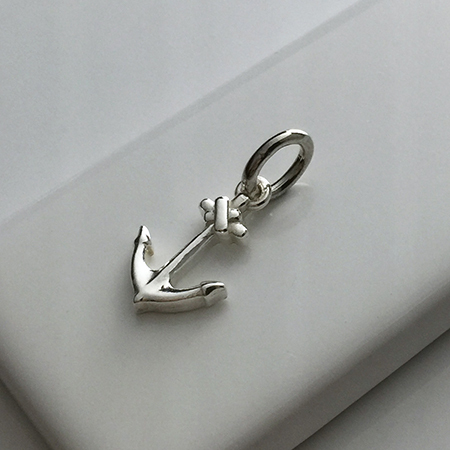 Our other Anchor pieces include a sterling silver Anchor Necklace, Ring and Stud Earrings. Sharing Hope, Luck and Steadfast in all styles of jewellery. Anchor Collection by Bianca Jones Jewellery, encourage a loved one in the pursuit of their dreams.